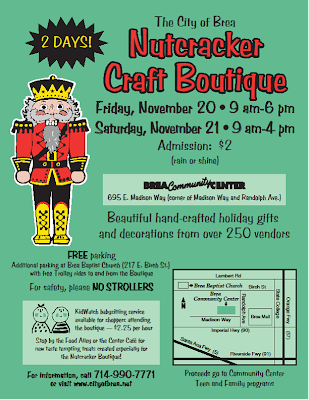 The next place I will tote my gourds will be to the Nutcracker Boutique, November 20th and 21st in Brea, California. If you can't quite read the flyer above, the address is 695 E. Madison Way in Brea. For more information please call 714-990-7771 or go to http://www.cityofbrea.net/. I'll be outside by the west entrance in spot #37...as usual, I'll be praying for good weather.